This is an outrage, is what it is. Not a huge outrage, like when your favorite candy bar is discontinued or Burger King runs out of hamberders, but certainly enough of an outrage to wake Snacktaku America from its long slumber (Snacktaku Japan never sleeps). Easter snacking staple Peeps has been vigorously violated by the forces of cereal licensing. Peeps are marshmallows shaped like baby animals that have been coated with colored sugar and dotted with tiny “eyes” that stare into your soul as you raise them to your mouth and then get stuck between your teeth. Limited Edition Peeps brand cereal is “marshmallow flavored” cereal with marshmallows. That might seem fine, but there are several problems with this cereal’s composition. Nothing in the box is shaped like baby animals. The crunchy cereal bits are generic Os. The dehydrated marshmallows are small discs. If hard-pressed, one could imagine they are sand dollars or some sort of bacteria. Ringworm? There is nothing cute, fluffy or sadistically evil about biting into any of those things. Nothing should be “marshmallow flavored.” With an abundance of marshmallow in the wild, there is no reason anything should be made to taste like it. If you need marshmallow flavor, use marshmallows. In this situation, Kellogg’s did use marshmallows, but I guess they weren’t good enough and needed to be bolstered by flavored oats. If one of the biggest cereal companies in the world has no confidence in its marshmallows, how can we? The marshmallows are naked. No sugar coating. Not even any food coloring, despite an abundance used for the blue and pink oaty Os. This is just freaking lazy. We’re not even going to dedicate a whole paragraph to it. Colored oaty Os. What Kellogg’s did with Limited Edition Peeps brand cereal is juxtapose the marshmallows and oat bits. Instead of colored marshmallows, we get colored crunchy circles. Instead of sugar coated marshmallows, we get a strange sort of crumb coating on the Os. This isn’t f***ing Top Chef. Stop deconstructing our Easter candy. This is a disaster that could have been avoided. Shaped marshmallows. Colored marshmallows. Hell, shape the oats, even that would have been preferable to the final version of Limited Edition Peeps brand cereal. How many chicks and bunnies can you count on the box? Way more than are in my bowl. 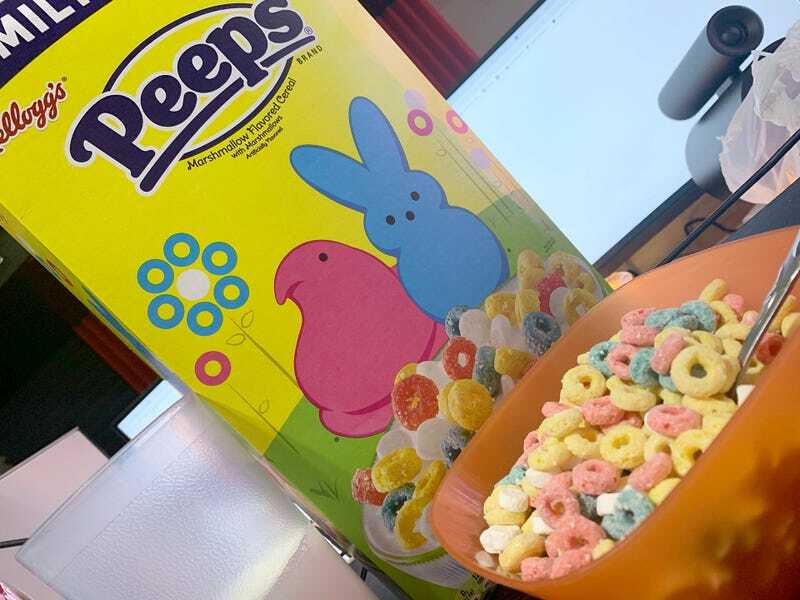 Limited Edition Peeps brand cereal tastes fine. It’s a bit too sweet, what with all that marshmallow flavor, and it leaves milk a tiny bit slimy, but eating it is fine. It’s just that missed opportunity aftertaste. Ick. Snacktaku cat Jinx loves the cereal, but she’s stoned.